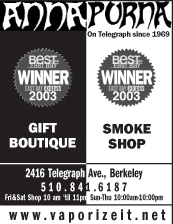 Annapurna of Berkeley's Home Page-Our 39th year on Telegraph Ave.
"Since 1969, this place has been the subversive heart of Telegraph Avenue, providing everything from pipes to toys for grown-ups, and pumping out the sounds of Iggy Pop, and Nirvana onto the sidewalk. Inside this darkly cavernous store, you will be lucky to see an inch of black wall or ceiling for ... the huge assortment of ... hookahs, incense and tobacco, jewelry and gnomes. It also carries various adult toys and Bachelorette Party Gifts, and has an impressive array of imported ethnic arts and crafts, as well as greeting and postcards ." Copyright © 2011 ANNAPURNA. All Rights Reserved. Since 1969, Annapurna has been a musical,fun, alternative place to shop. We have an eclectic mix of gifts reflecting a philosophy of open-mindedness and inclusion of all cultures. We promote humorous self-awareness, diversity, a love of life and responsible hedonism. 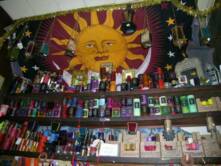 Our products are sensory and mind-awakening, a celebration of the joy and variety of our world. This is your life, take care , be kind and live well. Enjoy!